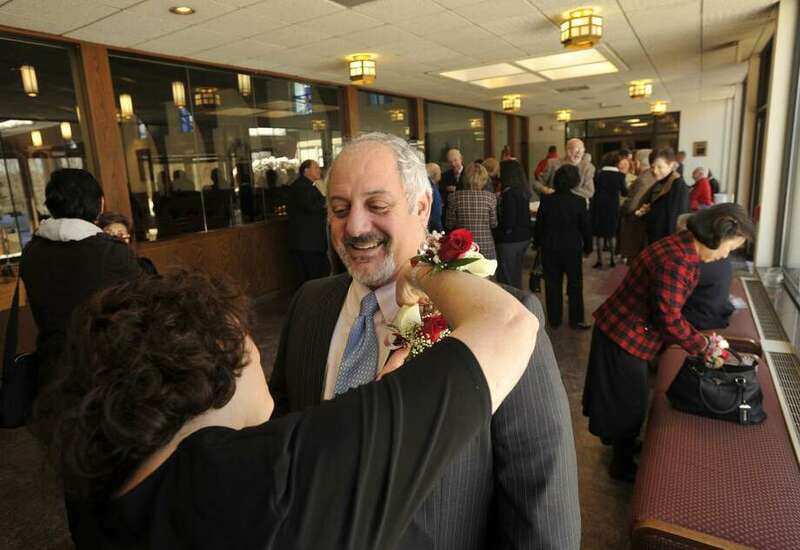 Gail Conti pins a corsage on her husband, Frank, before the Anniversary Mass at St. Leo Catholic Church in Stamford on Sunday, Feb. 10, 2013. The Contis will be celebrating their 25-year wedding anniversary this May. Giving his name as Dr. Jerome William Gorman, a fashionably dressed youth, was arrested in New Haven by the New Haven police last night, charged with the theft of clothing from a Yale fraternity house last fall. A search of an expensive roadster, in which he travels about the country, revealed two fur coats. The coats were found to be those stolen from the Presbyterian Church last Friday night. They are the property of Roswell Van Loan and his brother who reside at 223 Shippan Point. Detective Sergeant Daniel Hanrahan went to New Haven this morning and recovered the coats. New Haven police are holding Gorman for the thefts of the fraternity house. He will be brought here when the charge against him in New Haven is finished. Police do not believe he is a doctor. The Riverbank Parent Teacher Association has obtained the signatures of 766 residents on petitions urging immediate construction of another elementary school in North Stamford. The petitions, as previously announced, will be submitted for consideration of the Planning Board before its public hearing at 8 p.m. Thursday, on the Planning Board’s 1964 to 1965 capital projects recommendations. The Planning Board has included funds for construction of another North Stamford elementary school, in its 1964 to 1965 recommendations. However, this recommendation must be accepted also by the mayor; the Finance Board and the Board of Representatives before becoming effective. What’s the cost of disregarding Donald Sherer’s free advice? Maybe $1 million to Stamford taxpayers. City representatives thought they had rejected $1 million in raises for Stamford teachers and school administrators last month, but a procedural error that City Rep. Sherer R-19, tried to stop has led the state Education Department to put the raises into effect anyway. When the board voted Jan. 20 on rejecting the arbitrators’ decisions that led to the raises, they voted “no” — by more than two-thirds — on motions to accept the contracts. But the teachers union claimed, successfully, that people opposed to the contract should have been voting “yes” on a motion to reject it.